Today, a lot of people & companies use a tech term “Cloud”. Firstly, we need to understand what is cloud? 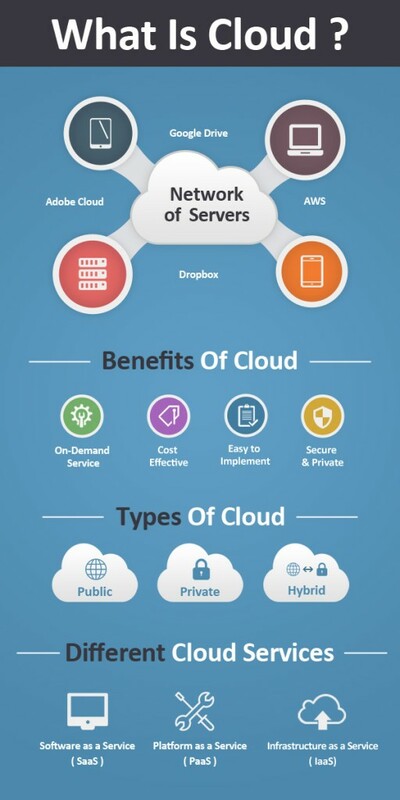 Cloud is not physical, it is a network of servers which are connected to each other. These servers provide online services & allow to store data and access it, like google drive, dropbox, adobe creative cloud etc. We use the cloud in our daily life. Cloud is a big deal. Your decision to move to the cloud server is very beneficial for your business. With cloud, you don’t need to buy hardware equipments, you only have to pay for what you use. With this service model, you can save your money & you don’t need to make long time commitment. It is very easy to upgrade or downgrade your service quickly. You can access data any time from anywhere with Internet connection. There are three types of cloud deployment model. In this model services are available over the internet for public use. Service providers own & manage this cloud model which may be free or subscription fee required. For example, Amazon web services (AWS) offers online services, Dropbox- a storage space for personal files, google cloud services, facebook cloud service etc. Security & privacy is the main concern for every company. Private cloud provides hosted services to limited people or organizations. This model provides highest security & control level. You can access your data from your laptop, mobile device or tablets with an Internet connection. There are two types of private cloud. A) On-Premise: This cloud is hosted & managed within an organization own facility. It is best for security because one have full control over cloud system. B) Externally Hosted: This type of cloud is hosted & managed by a third party. It offers total privacy because you don’t need to share resources. Hybrid cloud is combination of public & private cloud. A hybrid clouds offers benefits of multiple deployment environments in which company provides and manages some resources in-house and has other resources provided externally. In this service model, applications are hosted by a service provider & offered to users over the internet. It is most widely used service model. Users can use this service just with Internet connection. Examples of Saas are: Google Apps, CRM, CMS, online banking, email etc. It allows to upgrade & changed web applications quickly & easily. You don’t need to buy softwares, you can rent hardware, operating system, & network capacity over the Internet and it will cut your business cost. Google app Engine is an example of Paas. It is a way of delivering cloud infrastructure servers, storage, network and operating systems as an on-demand service. You don’t need to buy servers, networks equipments etc. Iaas allows you only pay for the resources used. Save your money and providing your business exactly what it needs. Cloud is the best platform which offering quality service at affordable price. It is one the fastest growing technology in IT.